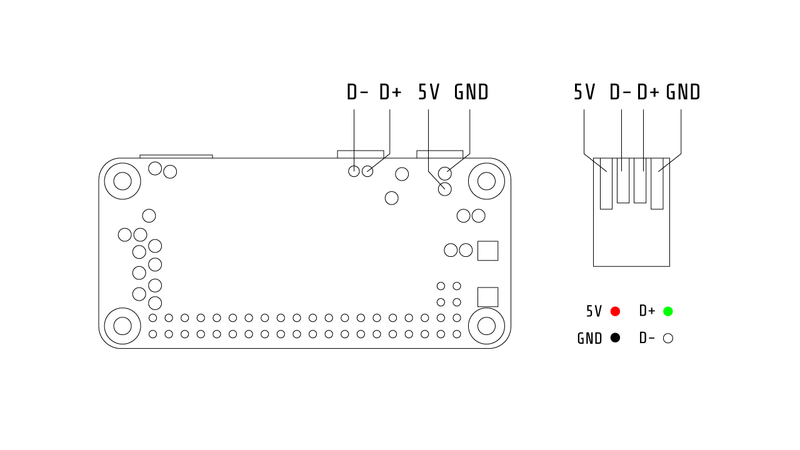 [UPDATE] It's probably best to use the 5v and Ground GPIO pins instead of the testpads, so use that if you have the option. Make sure that you have the wifi configured on the operating system before you attach the wifi board. Step 1. Remove the wifi board from inside the dongle casing. I added some solder to the contacts. Step 2. Cut and tin the red, white, green and black wires. Make them about 40mm long. Step 3. Solder the wires onto the wifi board and the pads under the Pi Zero using the pinout diagram from earlier in the video. Step 4. Cover the wifi board with tape, fold it over and secure it in place. You now have a really tiny, slimline wifi addon for your Pi Zero. One thing to note is that the power supply cannot go over 5v, since the 5v test pad is unregulated. I fried the first wifi board I tried, so stay away from using cheap chargers.